In the age of the social "avalanche", we're bombarded with a non-stop stream of information. From millions of websites, thousands of apps, to hundreds of channels, endless varieties of choices awaiting us. Smartphones are now laden with so many mind boggling features that you wonder who on Earth is capable of using them. Against this landscape of ever growing complexity, consumers are hankering for a return to simpler carefree days. Spoiled by the likes of Apple, they want stuff that works out of the box without the need to install A, calibrate B, or update C.
How can one offer simple solutions in an increasingly intricate world? I love the simplicity and elegance of these approaches. Often, while trying to wow our customers, we forget that what they're truly looking for is a quick and easy way out. Layering on feature after feature, we seek to amaze them with bundled services, state-of-the-heart shiny new features, and upgrades which really does nothing for them. Instead, we frustrate them with needless over-engineered complexity. 1) Reduce the number of forms, and the information needed in each form. If possible, pre-fill information for your customers, using smart technology where available. 2) Provide self-service online or at kiosks, making it as simple and intuitive as possible. 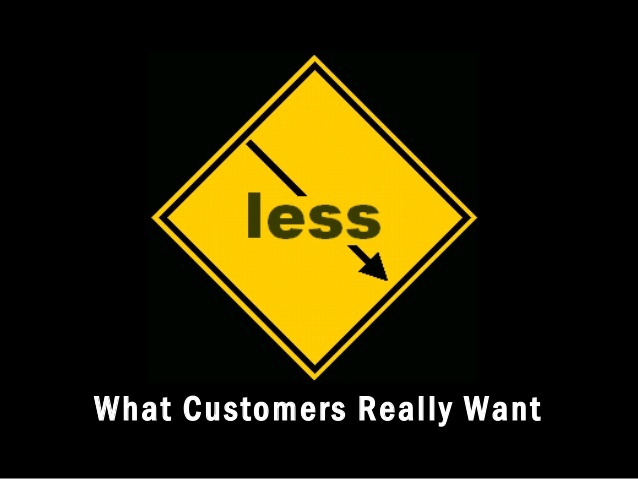 3) Always inform customers what they should expect. While occasional surprises may be nice, it is better not to shock your customers with the unexpected (unless of course you are a haunted house operator). 4) Embrace Zen in your packaging. Minimal instructions. Minimal waste. Maximum joy. 5) Live a day in the life of your customers. Find out what makes them fume and eliminate those factors if they're within your control. 6) Offer multiple points of contact - email, social media, phone - and make sure that you respond quickly to any queries. 7) Always close the loop with your customers and do it as soon as you can. Nothing frustrates a customer more than a request which fell on deaf ears. Are there other ways we can make life simpler (and more enjoyable) for our customers?